Looking for the ideal place to host a golf outing? Look no further! Hampshire Country Club boasts one of the finest 18-hole golf facilities in the Westchester area, with spectacular views of Long Island Sound. We host golf outings and corporate picnics from April through October with groups ranging from 50 to 144 players. Our packages include a fantastic breakfast or BBQ lunch, refreshments, snacks on the golf course, and an open bar with dinner stations. We can also tailor a package to fit your specific needs. For a closer look at our distinctive and challenging course, click here. Every outing features our complimentary Outing Management Services, including: tournament registration and scoring; custom scorecards; cart signs; and complimentary range balls. 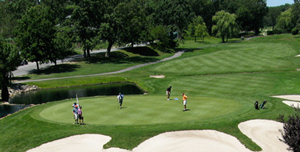 Each participant at your golf outing will be treated like a Hampshire Country Club Member. Our professional staff will take care of every aspect of your event, ensuring that all of your needs are met and your event runs smoothly. That way, you and your guests can relax and enjoy the event! For more information, please complete the information request form to the right or contact Dorothy Mourouzis at 914.698.4610 ext. 214 or dmourouzis@hampshireclub.com. We will be happy to personally attend to your group's golf outing needs.